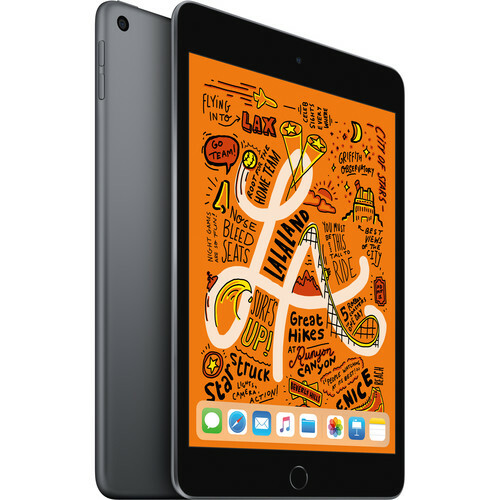 Built with the same form factor as the iPad mini 4, but up to three time more processing power, the 7.9" iPad mini from Apple has been upgraded with the A12 Bionic chip with Neural Engine, a 7.9" Retina display with True Tone, and Apple Pencil support, so you can sketch and jot down ideas as they come to you. This iPad mini is just 0.24" thin, weighs 0.66 pounds, can store up to 256GB of data, and comes in a space gray finish. The tablet's 7.9" Retina Display features a native resolution of 2048 x 1536, showing over 3 million pixels at 326 ppi. It also features support for the P3 wide color gamut, an anti-reflective coating with 1.8% reflectivity, 500 cd/m2 brightness, and True Tone, which dynamically adjusts white balance for more natural looking images. The Retina Display's capacitive touchscreen lets you utilize all the multi-touch gestures of iOS. The mini is driven by Apple's 64-bit A12 Bionic processor with Neural Engine, which allows it to use real-time machine learning to recognize patterns, make predictions, and learn from experience. All of this lets you run apps like Adobe Photoshop CC, experience augmented reality, or play games with immersive graphics. Accompanied by the A12 chip is the M12 motion coprocessor, which measures the motion of the iPad via the accelerometer, three-axis gyroscope, and compass, lightening the load of the A12 Bionic chip and freeing it up to process multiple tasks while enabling it to maintain fast performance. The iPad mini may have the Retina Display, but it still manages to maintain its 10-hour battery life. That's because the A12 chip isn't just more powerful; it's also more efficient. The iPad mini comes with iOS and Touch ID. Designed for the iPad, iOS features News, enhanced multitasking, a shortcut bar, editing tools, updated multi-touch gestures, and more. Touch ID uses your fingerprint to unlock your device as well as make secure purchases in iTunes, iBooks, the App Store, and more via Apple Pay. Thanks to Wi-Fi 5 (802.11ac) and Bluetooth 5.0, the iPad mini can connect to your network and integrate with iCloud, so you can sync your iPad mini to your other iOS devices and Mac computers. Push photos, download apps, and continue from where you left off in iBooks with iCloud. iCloud also offers cloud storage so you can back up your contacts, photos, and important documents to Apple's cloud servers. You can also restore your iPad mini to a previous state using iCloud. The iPad mini features a thin, light, and portable design that makes it a solid on-the-go companion. At less than a pound and 0.24" / 6.1mm thin, it's easy to carry with you in one hand or take out of a pocket or bag whenever inspiration strikes. The A12 Bionic chip with Neural Engine enables a high level of power and intelligence. It uses real-time machine learning to recognize patterns, make predictions, and learn from experience. With all this power, you can run apps like Adobe Photoshop CC, experience augmented reality, or play an immersive game with console-level graphics. The iPad mini packs over 3 million pixels into a 7.9" display, and Apple made them all count. Whether you're reading in the park or editing a video in your home office, the high brightness, wide color, and antireflective coating offer true-to-life-detail and sharp text. True Tone dynamically adjusts white balance so images look more natural in most light. The 7MP front and 8MP rear cameras in iPad mini let you take vivid photos and cinematic videos. But the fun doesn't stop there. Make FaceTime calls with friends, scan documents and mark them up, or even use augmented reality to plan out your living room decor. The front FaceTime HD camera takes photo at 7MP and features an f/2.4 aperture, retina flash, wide color capture, and 1080p Full HD video recording at 30 fps. It also has an Auto HDR mode for both photos and videos. The rear camera and its 8MP sensor are backed by an f/2.4 aperture, a five-element lens, HDR, auto image stabilization, and more. When recording videos, the rear camera shoots at Full HD (1920 x 1080) at up to 120 fps, while also allowing for video image stabilization and 3x video zoom. Apple Pencil opens up new possibilities for the iPad mini. Together, they turn iPad mini into your take-anywhere digital notebook. Jot down notes, sign documents, and fill out forms or capture your most creative ideas by drawing, painting, or sketching on the go. iOS on iPad mini gives you the full iPad experience in a compact form factor. Use multiple apps at once, launch your favorite apps from the Dock, and drag and drop files using simple multi‑Touch gestures. And you can access your files all in one place with the Files app. iPad mini comes with powerful Apple-designed apps, like Photos, Maps, Messages, News, Mail, and Safari. And with over a million iPad apps on the App Store, there's an app for anything you want to do. Edit a video, check your social media, sketch an idea, and join a battle royale with friends. iCloud keeps things like your photos, files, and notes safe, current, and conveniently available on all your devices. And the Files app lets you manage all your files - in iCloud Drive and on your iPad mini - in one central location. Like every Apple product, the iPad mini was designed with your privacy and security in mind. Touch ID makes unlocking your iPad mini simple and secure. And you can make purchases conveniently and safely with Apple Pay. Just place your finger on the Touch ID sensor and you're good to go. Apple believes technology is most powerful when it's most accessible to everyone. That's why the iPad mini comes with accessibility features that support vision, interaction, hearing, and learning needs such as VoiceOver, which tells you what's happening on your screen, and Switch Control, which lets you interact with your device without touching it. Box Dimensions (LxWxH) 8.5 x 5.7 x 1.9"